The Malecón in Havana is both a broad street and seawall along the north shore of the city, west of the Havana Harbor entrance. The 5-mile (8 km) stretch is popular day and night – for cruising in a classic car, for fishing, for wandering and for late-night rendezvous. The road connects the Havana neighborhoods Vedado, Centro Habana (Central Havana) and La Habana Vieja (Old Havana). In April, Scott and I walked along the Malecón east to west, from La Habana Veija to Vedado, where we treated ourselves to the most refreshing daiquiris and Cuban sandwiches at the Hotel Nacional. For the video, I chose to edit in the chronological order of how the road was built, from west to east. Building of the Malecón began in 1901 to protect the city from the waves and storms coming from the Straits of Florida (part of the Gulf of Mexico). It was built in three stages: 1901 – 1902, 1902 – 1921 and 1949 – 1952. The street Malecón (English: pier, jetty) is officially called Avenida de Maceo. José Antonio de la Caridad Maceo y Grajales was second-in-command of the Cuban Army of Independence in the late 19th century. You can see a large statue dedicated to him about 23 seconds into the video. While today most of the magnificent buildings facing the seawall are rather dilapidated, the changes towards more prosperity are starting to become visible. There are numerous buildings that have already been restored and several restaurants and casa particulars (private B&B) in this prime location. From what I understand, no private person can own an entire building in Cuba, unless the whole building is a single-family residence. People can own apartments (as of fairly recently). All the individual apartment owners would have to come up with a plan to restore and renovate their building together. The government does have larger restoration projects, which have made it possible to see some of Havana’s century-old buildings restored to glory. I am very curious to see how the country, the city of Havana and particularly the Malecón will develop over the next few years and decades. I collected some footage (and photos) of the Malecón at night. But I’m saving those for a future “Havana At Night” video… Also there was more street art, which I’m saving for a future video about Havana Street Art. The song featured in this video is “Cuban Sandwich” by Kevin MacLeod (incompetech.com). It is licensed under Creative Commons: By Attribution 3.0 License. Thank you, Kevin! In the next few days, I will upload a post with photos from along the Malecón on my personal blog. Just wanted to share how much I enjoyed this short but sweet Malecón Moment. I recently visited Havana and stayed took a few walks past places in your video. (I have a lot of photos, but few videos.) I know how much effort goes into something like your vid. It’s really nice, including that music. 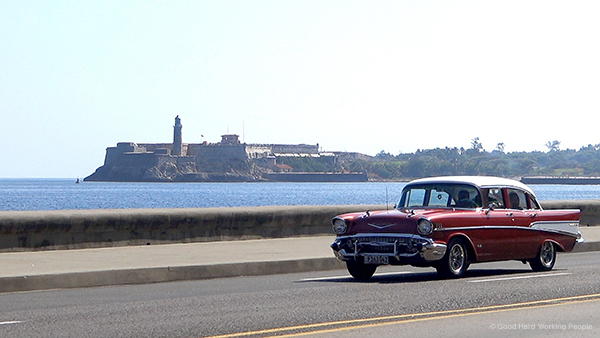 It’s not the cha-cha, but… even better for a breezy, light-hearted stroll along the Malecón! Thanks for posting it. Thank you so much for your sweet comment. I’m a bit jealous that you were in Cuba recently. While we were there we started talking about moving to Florida (form Colorado) just so we could easily go to Cuba for long weekend trips. It hasn’t happened yet. I checked out your website, too. Very cool – and quite amazing that you have kept it going for so long and with that retro look. Great photos there, too! Thank you again for your awesome comment!